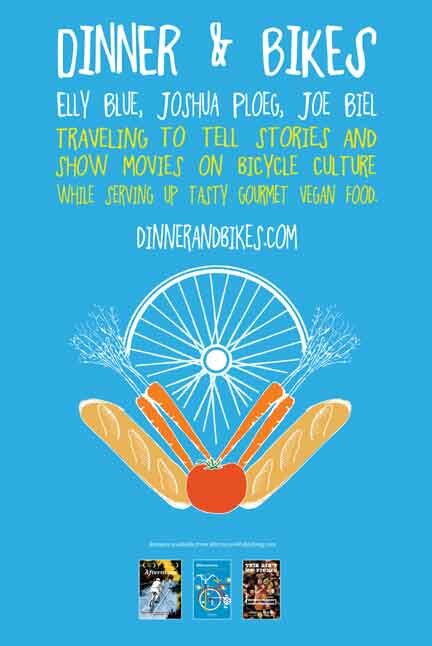 We are excited to announce the dates, route, and program for Dinner and Bikes 2013! We’ll be traveling the central and northeast U.S. in May — which happens to coincide with Bike Month. Here is our rough schedule so far. It will change a bit as dates are confirmed and switched around. Do you live in any of these spots and want to work with us to bring Dinner and bikes to your town? Get in touch, we’re booking now. Our program will be a little different this year, showcasing our recently finished major projects. Joe’s documentary, Aftermass, is nearly done. He’ll be showing excerpts that add up to nearly the length of the full documentary. Elly will be presenting her new book, Everyday Bicycling, a friendly, basic guide to bicycle transportation that includes chapters on carrying cargo, family bicycling, and advocacy. And Joshua’s food will continue to wow everyone. We’re also excited to welcome Aaron to our team. You’ll meet Aaron as the smiling face behind our traveling bicycle and food themed bookstore. He’ll also be acting as roadie as well as documenter of the trip, blogging and recording as we eat and talk our way around this corner of the country.